The first time I got involved into theater I was 12. I attended a workshop facilitated by PETA, but didn't landed on the role I auditioned for, my cousin was casted. The consolation for not being on the lead role was, the play that I was part on won and my cousin and I became a member of PETA. The very first musical that I watched was Miss Saigon with Lea Salonga playing Kim and Leo Valdez playing the Engineer. I became fascinated and amazed after watching it. The very first play I saw with REPertory Philippines was " Miong, " a musical based on the life of Emilio Aguinaldo with book and lyrics by Joy Virata. Long before Tanghalang Nicanor Abelardo (CCP Main Theater), the FEU Auditorium was the preferred stage pre and post war era. Being a member of the FEU Theater Guild and the resident stage manager, I had the opportunity to experience and encounter Zenaida Amador during the touring production of Miong. I was scared and thrilled with Bibot seriously. Strict and perfectionist she was. Thankfully all the greatest actors that we have today came from REP.
Prologue was directed by Jaime del Mundo and choreographed by Dexter Santos. The scene unfolded how REPertory started. A rainy evening in March 1967, they performed " Who's Afraid Of Virginia Wolfe?" to an audience of sixteen. Fifty years of telling stories as the cast and REP 50th core ensemble sung and danced to the tune of " We Tell The Story " from the Caribbean musical Once On This Island. I anticipated that and I felt ecstatic about it for it was the first musical I stage managed, back when I was still in college which was staged at Concert Of The Park in Luneta. Suite 1 wrote and directed by Miguel Faustmann and choreographed by Rose Borromeo. 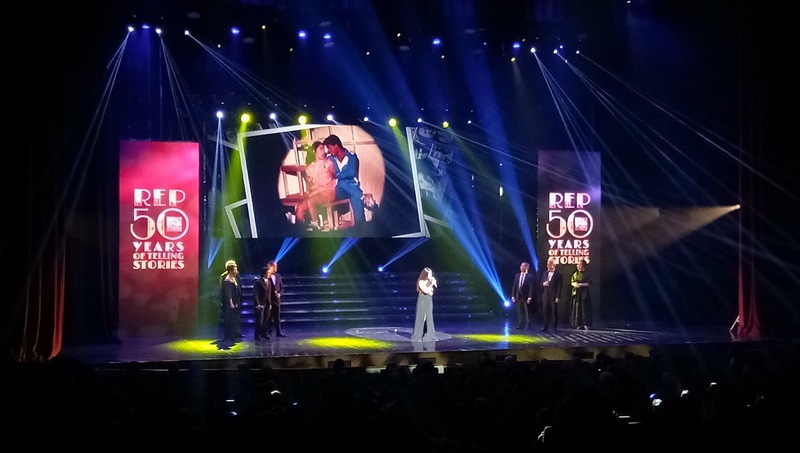 A scene that honored the dreamers of REPertory, Zenaida Amador, Baby Barredo, Leo Martinez, Toni and Monina Mercado and Buddy Paez. They started the " Impossible Dream" ( from the musical Man Of La Mancha, sung by Audie Gemora and Michael Williams) and since then became a" Tradition " ( Fiddler On The Roof). 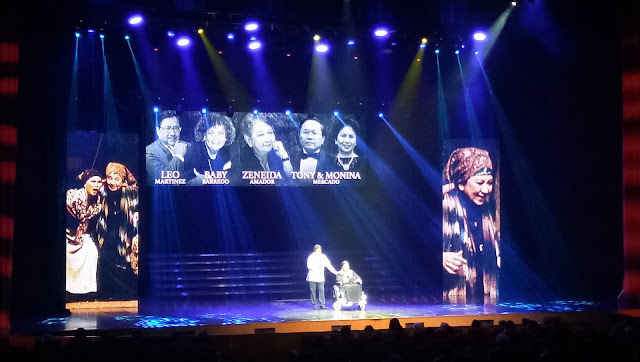 I was amazed, astounded and awed to see Leo Martinez assisted Baby Barredo in a wheelchair onstage. The show must go on as they say. Suite 2 directed by Audie Gemora and choreographed by Anna Marie Aragon, Deanna Aquino, Paulo Infante and PJ Rebullida were dedicated to the tellers - actors and dancers. For me it was the best suite of the night and the highlight of the evening. Songs from " A Chorus Line " (I Hope I Get It, Ballet and One), " Camp Rock" (We Rock) and" West Side Story " (America) were the winning performance especially past choreographers joined onstage in " One " unforgettable moment. Suite 3 directed by Raymond Launchengco, choreographed by Deanna Aquino and narrated by Menchu Launchengco Yulo, to honor the artisan who contributed their creatives in REP stage. These are the designers from lights, costume, makeup and production design whose expertise made " Magic To Do " (Pippin). Suite 4 wrote and directed by Freddie Santos and choreographed by Deanna Aquino paid tribute to the hands of the unsung heroes of stage. Stage manager, Property Master, Dresser, Stagehand, Chief Of The Fly among others and by " Putting It Together " (Putting It Together) a " Comedy Tonight " (A Funny Thing Happened On The Way To The Forum) was polished. Audience were delighted as Mitch Valdez returned onstage accompanied by Franco Laurel, JM Rodriguez, Jack Salud and Red Nuestro. Suite 5 directed by Michael Williams dignified the works of the interpreters - the director, musical director and technical director. " Finishing The Hat " (Sunday In The Park With George) has been extraordinary and exemplary over the years on how these individuals motivated the finest and rarest thespians what we have today. Suite 6 directed by Menchu Lauchengco Yulo and choreographed by Deanna Aquino to realize the storytelling on how REP impacted theater for young audience. With the narration from the Artistic Director Joy Virata, this scene focused on " Oh, The Things That You Think " (Suessical) as being told by the prolific playwright through its regular season for Children's Theater. Suite 7 historically , respectfully and theatrically gave so much pride and honor in memory of the REPpers onstage and offstage who had left their craftmanship and showmanship. I can't help myself to be overwhelmed as their names and pictures were projected. Miss Saigon and REPertory alumni Monique Wilson came up on the stage during the finale with the song from the musical Baby. As " The Story Goes On, " REPertory Philippines will continue its mission and vision showcasing and discovering the best cast and crew what the Philippines has to offer to the world stage. Another song that I anticipated to be sung was the iconic and signature repertoire " One Day More " from the musical Les Miserables. 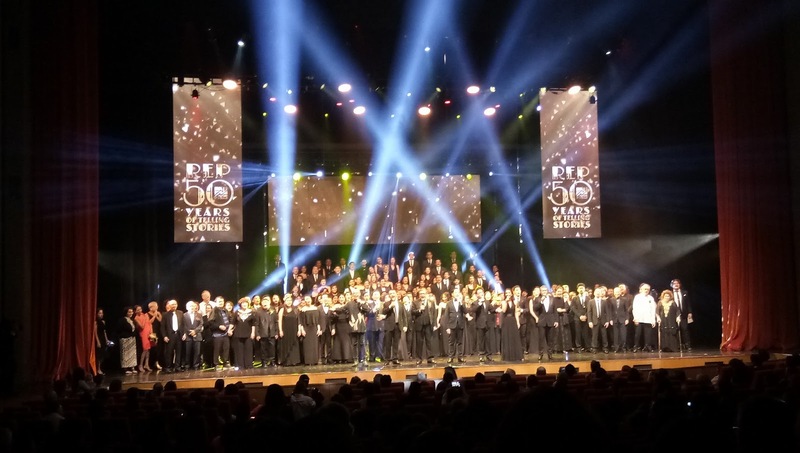 Original cast, new REP blood and the entire REP 50th cast belted this powerful song. For the final bow, all REPpers were invited onstage to sing the anthem, " Come Home To Rep " written by Ejay Yatco, musical director and arranger of the 13 piece orchestra of the night.